The Lindner Center for Conservation and Research of Endangered Wildlife’s (CREW) world-renowned scientists form critical partnerships with other leading conservationists and governmental and non-governmental organizations to achieve CREW’s mission to Save Species with Science®. Through their research, CREW scientists have become world experts on the reproductive physiology of Sumatran and Indian rhinos. In an effort to increase animal numbers and improve genetic diversity, CREW uses science and technology to achieve numerous reproductive breakthroughs in these highly endangered Asian rhinos. CREW scientists developed sperm cryopreservation and artificial insemination procedures for the Indian rhino and produced the first rhino calf by AI with frozen sperm. 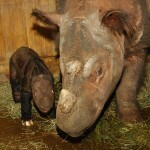 CREW scientists unraveled the mysteries of Sumatran rhino reproduction and produced the first Sumatran rhino calf bred and born in zoos in 112 years. Sperm samples from some of the most genetically valuable rhinos in the world have been collected and cryopreserved in CREW’s CryoBioBank®. 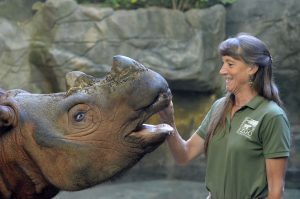 Learn about special exhibit space for the Cincinnati Zoo’s Sumatran rhinos, one of the world’s rarest animals. CREW scientists partner with many organizations and experts to achieve their goal of saving rhinos with science. CREW scientists publish their breakthroughs in scientific, peer-reviewed journals and in articles for the popular press.